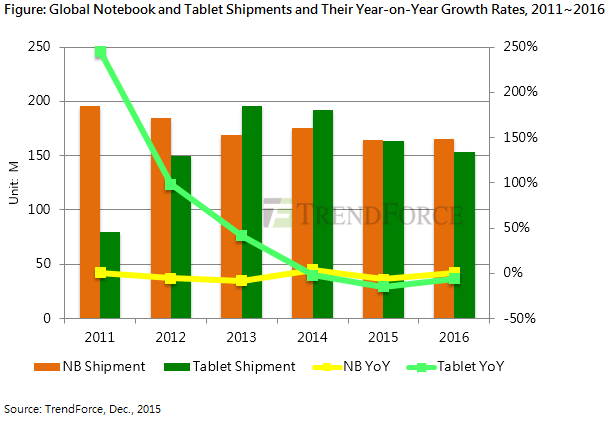 TrendForce is anticipating notebook shipments to fall by 6.4 percent and tablets by 14.9 percent year-over-year. Market researchers at TrendForce have lowered their 2015 expectations for worldwide shipments of PCs. Specifically, the analysts are expecting notebooks to decline to around 164.4 million units or 6.4 percent lower than 2014 numbers. Nonetheless, TrendForce is slightly optimistic about a small rebound in 2016 as the analysts are predicting a 1 percent rise to 165 million units shipped. 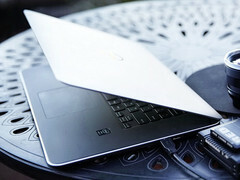 The firm claims that newcomers to the market - especially Xiaomi and Huawei - will stabilize the notebook market by attracting more buyers next year. As for the tablet computer, TrendForce is predicting an even larger fall in total shipment numbers. The costly Apple iPad and lack of any eye-catching innovations are not helping to attract new customers to the market. The source claims that smaller and more inexpensive tablets are increasingly being replaced by smartphones. 10-inch and smaller tablets will thus continue to lose market share rapidly. The firm is predicting a volume decrease to 163.4 million units or 14.9 percent lower than 2014 numbers as a result. The tablet market is expected to fall further to 153.4 million units (-6.1 percent) by the end of 2016. Inexpensive notebooks with a native display resolution of 1366 x 768 pixels dominated sales throughout 2015 by as much as 80 percent of all notebook sold. Meanwhile, FHD notebooks make up the other 18 to 19 percent. By 2016, TrendForce is expecting FHD notebooks to rise to 25 to 28 percent of all notebook sales. Additionally, sales of detachables should increase by 30 percent as they become a more viable alternative to the standard notebook.